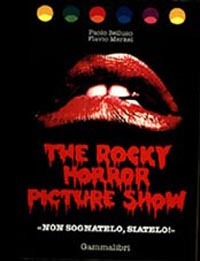 Description: A Collection of Rocky Horror Stories from around the world. Availability: Amazon and Book stores. Description: Great Book. Filled with interesting storie and facts. A MUST ! It covers the history from the events leading up to the London production of the play, through the production of the movie and the Broadway stage show and film release. Publishing details: 1990 Stabur Press, Inc. 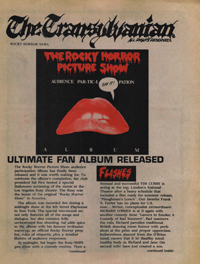 Description: Fan Club president recounts the history of Rocky Horror cult, all with lots of cast photos and information. Publishing details: 1995 Stabur Press, Inc.
Value: Sells at current issue price. Description: More of the same. Description: Photos and script from the entire film in a comicbook format. Description: Same as above in hardcover format. A very rare find indeed. Description: I only know of one of these. They were printed in German. 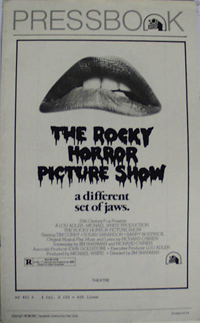 Description: Some considered it to be the Rocky Horror bible. Most information is out of date. Very Poor Binding on this book. 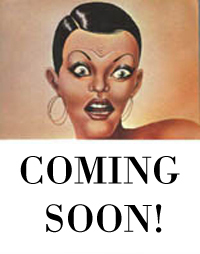 Publishing details: 1979 Dewynters Ltd, London; (Publishing date 1 June 1979). 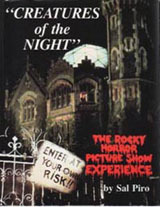 Description: Photos from the film and several different stage casts including the original cast. 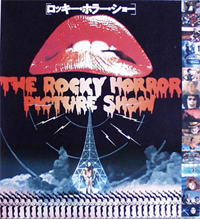 Also has the history of the stage show through the filming of the movie and the lyrics to all the songs. One of the most stylish and beautiful RH publications. Publishing details: Star Fleet Productions. 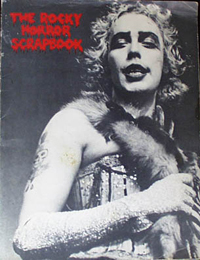 2000 Limited Edition copies originally printed. 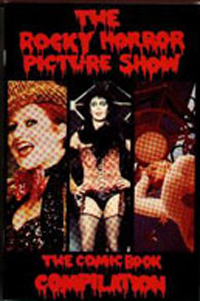 Reprint now available from Dark Refrain and RHPS Fan Club. 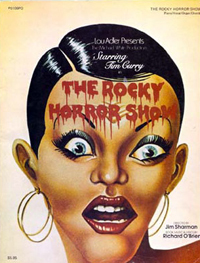 Description: Original photos from London, Roxy, Broadway, and many foreign casts. 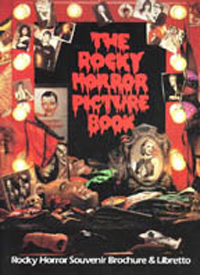 Includes original theatre location details, script notes, loads of negative photo prints, magazine articles and production reviews. Publishing details: 1991 Stabur Press, Inc.
by Sal Piro and Michael Hess. Description: Includes full script of the movie with audience participation response inserted. Provides special collectors index at the back.. 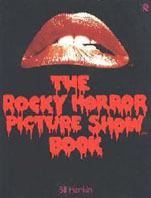 Description: A historical book of the stage show. Some terrible Hanley production photos; Man! Publishing details: 1988 Fan Club Tour - Japanese. Description: Includes cast profile, general information and libretto of the film all written in Japanese. Absolutely beautifully compiled and presented brochure. Description: Includes a collection of all professional advertising artwork and biographies. Published by Druidcrest Music / EMI Music Publishing Ltd. Availability: Local music and book stores. 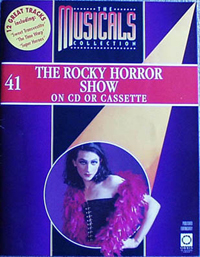 Description: Music and lyrics from the stage production. Publishing details: 1974 by Druidcrest Music, Los Angeles CA. 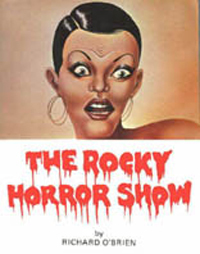 Description: Includes all music for songs from the stage show and photos from the Roxy production. 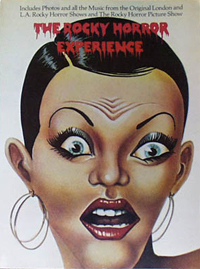 Publishing details: 1981 Hollenbeck Music (BMI) Los Angeles CA. Availability: Not Available. A rare find. Description: Includes all music for songs from the stage show, articles and photos of memorabilia, photos from London, Roxy and film cast with foreward written by Sal Piro..
Value: Sells at current cover price. Availability: Online Auctioning, some bookstores. Description: New graphics from 1990 Piccadilly production. 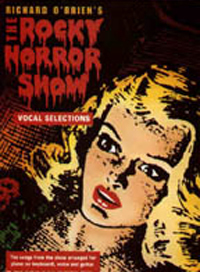 Includes music from the stage show and associated photos. 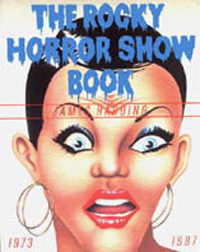 Publishing details: 1995 Orbis Publishing Ltd. Produced by Moran Publications, Surrey UK. Value: Sells at current issue price (£3.99). Availability: Order through local Newsagency (Australia). Description: Magazine comes with CD as a package. 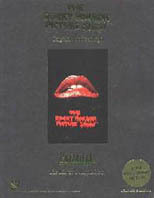 Includes on-stage decription each track, brief RH history and profiles of Richards O'Brien, Michael White and Tim Curry. 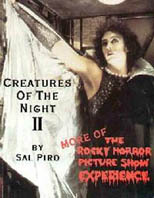 Publishing details: 1995 Premier Magazine, OSP Publishing. Description: Complete shooting script of the film. Publishing details: Blake Publishing Corp. Availability: Dark Refrain often has some available. Poster 1: Brad and Frank Bedroom Scene. Poster 2: Wedding Scene - Car and Church. Publishing details: 1979 Starfleet Productions, Inc. Description: Cover: Frank in lab-coat biting rubber glove. 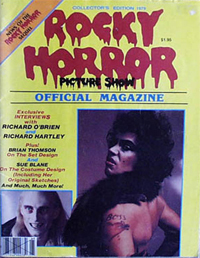 Interviews: Tim Curry and Richard O'Brien. 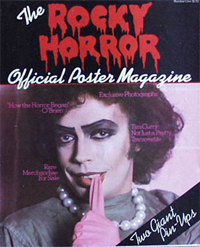 Poster 1: Tim Curry and Frank N. Furter (Mick Rock photo). Poster 2: Riff Raff and Magenta in space suits (Mick Rock photo). 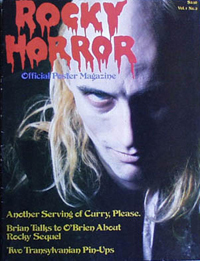 Description: Cover: Richard O'Brien as Riff Raff. Poster 1: Frank, Magenta and Columbia (Mick Rock photo). 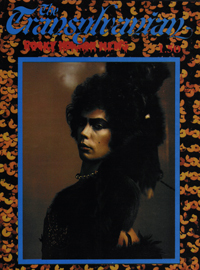 Poster 2: Frank strangling Riff Raff with whip (Mick Rock photo). Description: Interviews with Richard O'Brien, Richard Hartley, Brian Thomson and Sue Blane. 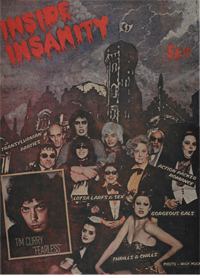 Also includes many articles about Rocky Horror at the time of publication. 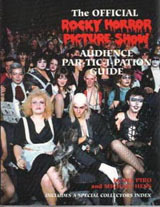 Size: 10 3/4" x 8"
Description: Includes articles on Richard O'Brien, Susan Sarandon, Barry Bostwick, Tim Curry, Little Nell, Richard Hartley, Brian Thomson and Sue Blane. 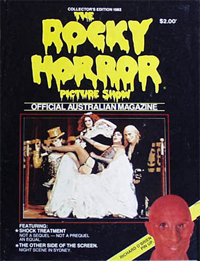 Also stories on Shock Treatment and its cast, Rocky Horror in Sydney and Sue Blane's original costume design. Availability: Dark Refrain may have some available. 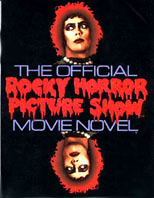 Description: Rocky Horror story told in comicbook format. Also available in 3 part issues. Description: 24 pages taken from other books (mostly music). Some images and details provided by Chris H.